My Dad met Morris Henry Hobbs through my uncle from Highland Park, Uncle Charlie Sanborn. Mr. Hobbs’ profession was as an architect but in 1934 architects and artists were in tough straits. However, Dad and Mr. Hobbs formed a partnership to produce etchings. 1934 was the second year of the World’s Fair in Chicago and, through some mutual friends, Dad was able to get an appointment with the Chairman of the Nations section. This area was composed of villages resembling the various nations that participated. My Dad’s idea to produce souvenir etchings was approved. 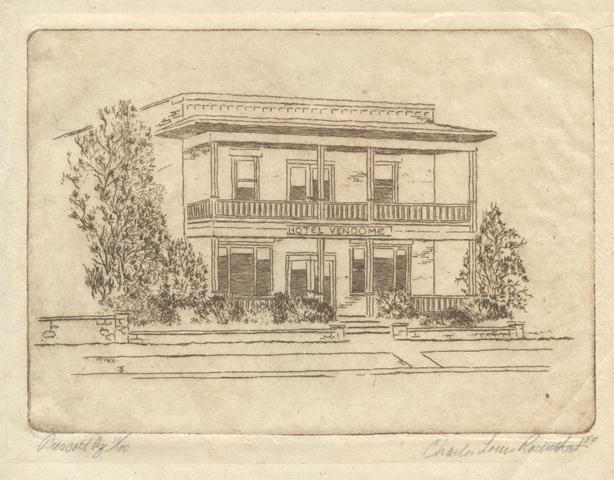 Then Mr. Hobbs drew and etched plates (I believe there were 16 in all) of scenes representative of the buildings. My Dad printed them. They were packaged in sets of 10 and sold at the fair. Business was good and I often helped my Dad on Saturdays. I was 16-years-old and still in High School. When I was 18, I started to work for my Dad full time at his studio. My job was to produce the etchings on our etching press. The press was operated entirely by hand. It was difficult, back-breaking work but I was young and I enjoyed the excitement of the Tree Studios atmosphere. After my Dad and Mr. Hobbs ended their partnership, Mr. Hobbs obtained another studio across the hall where I took art lessons from him. I also asked him questions on etchings and dry points. We continued to print most of his work. Mr. Hobbs taught me a great deal about etching, sketching in general and, I suppose, a little about life as he was doing nudes and it seemed there were always a couple of gals hanging around. Guess when I went over to ask him a question or two? Mr. Hobbs was a member of the Chicago Society of Etchers and a good friend of the founder and long-time Secretary, Bertha Jaques. After several demonstrations, Dad was able to obtain their OK as an official plate printer of the Society. Since many etchers did not have the time or equipment, we were able to pick up quite a few artists from all over the country. Our customers included many of the best known etchers of the era including Ralph Fletcher Seymour, James Swann, Leon Pescheret, Reinhold Palenske, Lee Sturges, Antonin Sterba, Richard Bishop, David Bekker and F. Leslie Thompson. We had a good relationship with these artists and were given many signed etchings. We also learned that one should never ship completed works to an artist without the dough in hand or very excellent credit. I had a lot of fun these years meeting with etchers, taking lessons from some of them and learning something about the World, and Bohemian life styles, that I never knew existed except in history books and novels. This period of my life was all too short but the practical side of my personality, and far more lucrative endeavors took over. Besides there were such things to consider as girls, sports, night clubs and even paying the bills. So I took lessons in accounting at Northwestern University (Chicago Campus), ditto several classes at the American Academy of Art (layout, lettering, pencil sketching), a course at Central College (YMCA) in marketing and copy writing and for about two years took open classes from Mr. Sterba at the Art Institute. Mr. Sterba was my first (big time) art teacher. He also had a studio in the Tree Studios building. 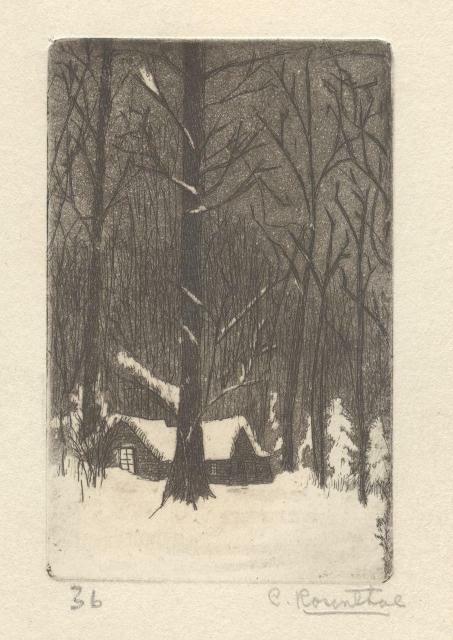 I printed all of his etchings at the time as he did not have a press. His lessons at the Art Institute were on figure drawings and painting. They were on Saturday afternoons. There were 6 or 7 people in the class. His fee was $1.00. 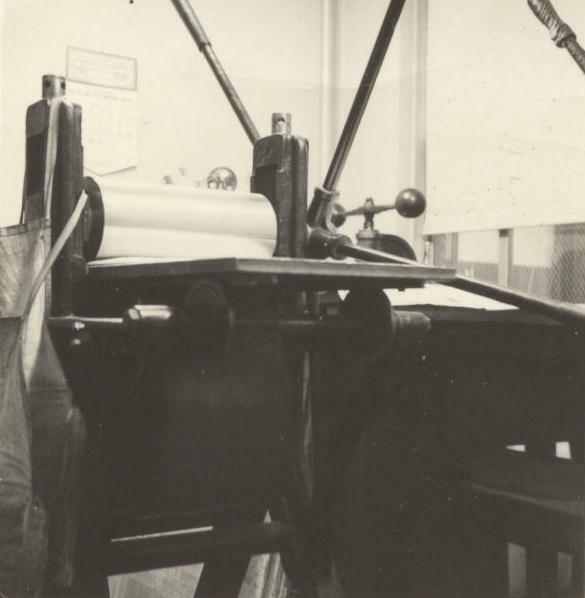 In the late 1940’s Charles Rosenthal focused his business on commercial printing and had a company in Itasca, Illinois on Irving Park Boulevard. Some of his many customers included Rand McNally, Inland Steel, and Northern Trust Bank. In a touch of irony, one of his best customers was Weber-Stephen Products Company – the makers of the Weber Grill – and the parent company of the restaurant across the street from Tree Studios. Charles produced and printed the first Weber cookbook. He sold his business in 1968 and moved to Scottsdale, Arizona where he resumed his artwork. He was a Juried Member and Past President of the Arizona Artists Guild. 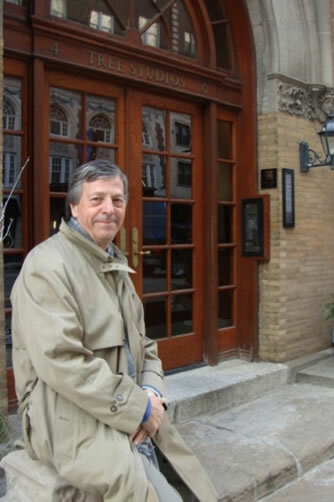 His etchings, paper sculptures and water colors are in many private and public collections. 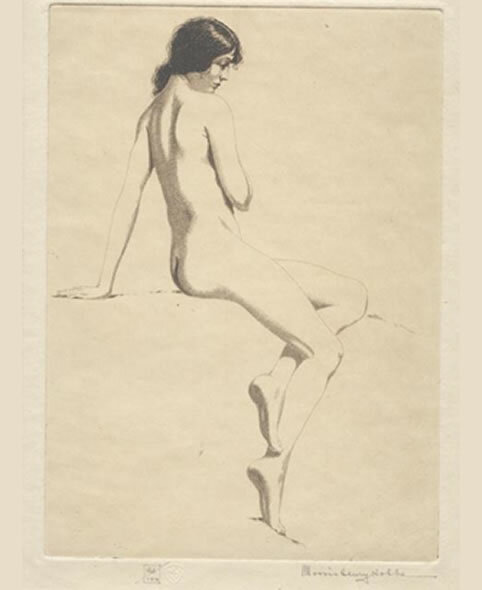 He donated the etchings he acquired during his time at Tree Studios to the Phoenix Art Museum. I am glad you found the article helpful. What a great idea to do a catalogue raisone of the etchings of your father-in-law. I have always loved his work. I know that the etchings Morris Henry Hobbs gave my father were some of his prized possessions. When my father passed away several years ago, I inherited these etchings. If you need any help on the Chicago portion of MHH’s work, I will be glad to assist. There may be additional information about MHH in the James Swann papers. 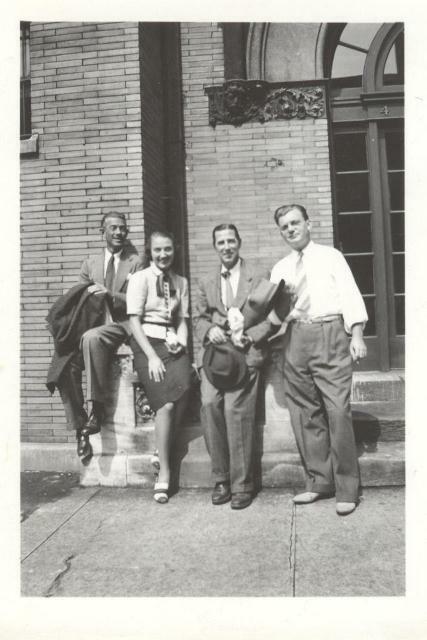 Swann moved from Texas to Chicago to apprentice with your father-in-law in the mid 1930’s. I believe they remained lifelong friends. My family visited New Orleans in 1958. One of the purposes was for my Dad to visit with MHH. Since I was 10 and somewhat of a pest, I was not able to come with. Thinking back it would have been a great experience. You are welcome to add a blog post about your father-in-law to this site. I would be honored to include it. I stumbled across this as I’ve been, off and on, trying to learn more about Morris Henry Hobbs. I live in New Orleans… in an apartment on Royal and St Ann, on the 3rd floor. On my front door is a pane of glass and, etched into it, it says “Morris Henry Hobbs 1938” …being curious of course I had to look and see if I could find anything on this mysterious character who had embedded himself in the front door, lol. I came across a painting/etching he did of the courtyard… and it’s funny because the statue and pillars are still here, just as they were in the painting, all those years ago. I found one photograph of him standing on the balcony with lots of plants as well… pretty fascinating. 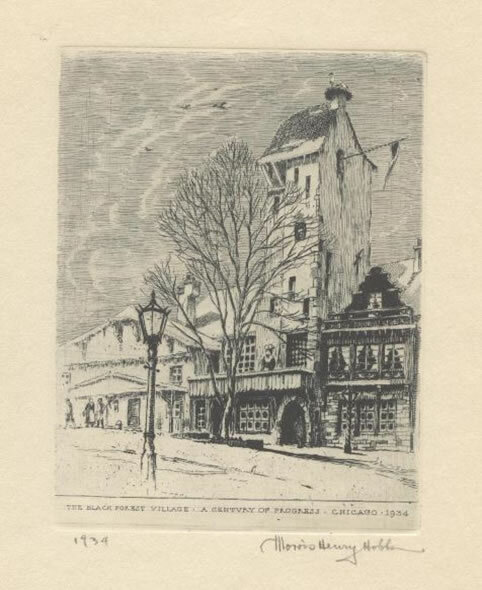 Great blog post – I recently unearthed a bunch of information related to Hobb’s architectural career in Chicago and found a small cache of prints. If either of you would like more information feel free to reach out. I would be interested in learning more about the prints that you found. Mr. Rosenthal, I found 2 pelican drawings by your father Charles Louis Rosenthal, in a thrift shop here in Kingman, AZ. They are both written on the bottom left ” Jacks Pelicans”. As I love pelicans, I took them home. I love them. Thanks for the comment. I am glad you are enjoying the “Jack’s Pelicans” drawings of my father. I do not know the specific story of where “Jack’s” is located, but I would imagine somewhere on the West Coast. My mother and father traveled extensively throughout the Western United States. My Dad took many pictures which he used for his drawings, etchings and watercolors. The actual artwork was created in the studio in his home. He often participated in shows in Flagstaff and Munds Park so it does not surprise me you found the drawings in Kingman. Mr. Rosenthal, I have acquired art that is handmade paper casting with 3 sections signed by 2 artist. The middle section resembles an ancient indian pueblo and has the signature Rosenthal and the other two sections are signed with a signature Nandi. Since there are other artists with the last name Rosenthal I am trying to find out if this art work is from your dad. Is there a way I can sent you a copy of this artwork. It would be nice to know which Rosenthal this came from. I live in the Phoenix Arizona area. Thank you. My Dad did many paper sculptures in addition to his etchings. In all probability he created the one that you own. I would be glad to take a look at pictures of the paper sculptures. You can email them to me at jimrosenthal5757@aol.com. Many thanks for your interest. I own a small etching press that I understand was designed by Morris Henry Hobbs. It is a Permo Etching Press and was manufactured by; Permo Products Corp. Chicago The rollers are 4.5″, the whole press is only 6.5″wide by 8.5″ long. I am looking for more information about this press. According to Claudia Kate Kheel who wrote her thesis on Morris Henry Hobbs, he designed the Permo Etching Press in the mid-1930’s. It could print a plate up to 4″ by 6″. It sold for $12.50 and was designed primarily for beginning students of printmaking and for those more experienced artists that wanted the option of using a miniature press. Despite the low cost the press had modest sales. I would think that the press you have is relatively rare. Hope this helps. I have a sketch or etching, I don’t know the difference by Antonin Sterba. 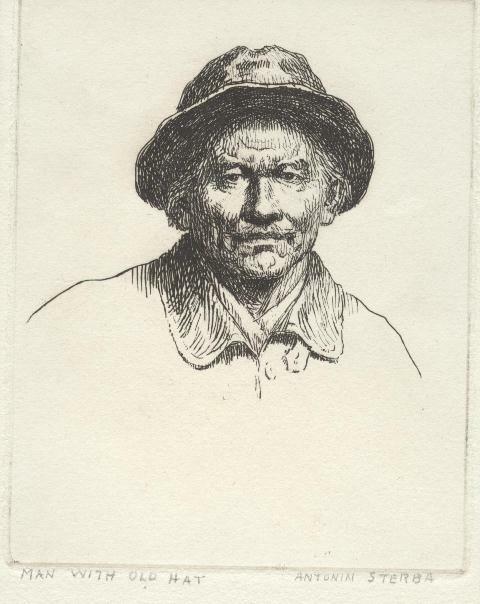 It is an old fisherman with a sailboat in the background. How would I know if it is an original? Antonin Sterba usually signed his works on paper – usually in pencil. If it has a “Sterba” signature, you can be pretty well assured that it is an original. Jim – Thought you would like to know that “Morris Henry Hobbs: A Catalogue Raisonné of Etchings, Engravings, and Lithographs” was published in 2017.